Alexis Tsipras, head of the Greek radical-left party Syriza, currently in the lead in national elections, wants a new bailout deal for Greece, including huge debt writeoffs. Socialist policies aside, on that score Tsipras is correct. Greece cannot possibly pay back the €245 billion it owes creditors. Germany fears contagion in the form of demands by other countries that will also want bailout deals or rule changes if Greece gets one. Yet, yet a much more destructive contagion via a cascade of defaults is all but assured if Greece is forced into default. Making matters worse, Finland has joined the no bailout parade. Even if Germany was willing to offer Greece some concessions, Finland does not want to go along. This poses an additional problem for the eurozone block that must agree unanimously to all such deals. With that backdrop, please consider Finland Emerges as Major Hurdle to Greek Bailout Deal. Finland has emerged as the biggest stumbling block to negotiating a new bailout deal with an incoming Greek government, telling its eurozone partners that it will not support debt forgiveness and is reluctant to back another extension of the €172bn rescue. In an interview, Finland’s prime minister [Alex Stubb] said he would give a “resounding no” to any move to forgive Greece’s debts and warned that a new government in Athens would have to stick to the terms of the existing bailout. “We will remain tough. It is clear that we would say a resounding no to forgiving the loans,” Mr Stubb said. The bailout of Greece has been a lightning rod for anti-euro sentiment in Finland. It was arguably the most enthusiastic cheerleader for austerity during the euro crisis. In an unusually tough stance that angered other European countries, it insisted in 2011 on receiving collateral from Athens before giving its backing to one of the Greek bailouts. Even if Finland was agreeable to bailout changes, the Size of Greece’s Debt Limits Scope for Solutions. Eurozone finance ministers agreed in November 2012 to consider further debt relief for Greece once it reached a budget surplus before interest payments, which it did for the last two years, and as long as it stuck to its promises of austerity and reform. But how much scope is there to reduce Greece’s debt burden? Around three-quarters of Greek public debt — or around €270bn out of a total of €317bn — is held by the official sector — the EFSF eurozone rescue fund, the European Central Bank as well as the IMF, according to IMF figures. 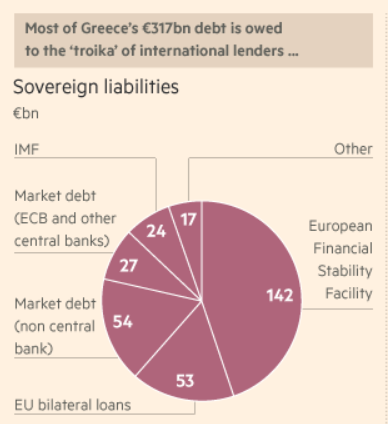 Of the €270bn, defaulting on the €24bn owed to the IMF is considered the ultimate taboo, even by Syriza. The ECB and national central banks are owed €54bn. The ECB is unable to offer any relief, since it could constitute illegal monetary financing of national governments. According to an analysis of options by the Bruegel think-tank, reducing interest rates on the €53bn in bilateral loans to the three-month borrowing costs of each eurozone governments would reduce Greece’s debt mountain by 3.4 per cent of GDP by 2050 (in net present value terms). A further 10-year maturity extension would shave off another 4.5 per cent of GDP. On its €142bn in EFSF loans, Greece only pays 1 basis point over the rescue fund’s borrowing costs, so there is little room for cutting the interest rate. But a 10-year maturity extension would cut the debt pile by a further 8.1 per cent of GDP. Together, these concessions would reduce Greece’s debt burden to only around 160 per cent of GDP, a long way from Syriza’s objective. But EU officials argue that the overall total matters less if annual payments are low and spread out over several decades. Other options, such as cheap fixed rate loans, or a much more radical debt forgiveness scheme along the lines of the Paris club, would impose direct losses on lenders and could be impossible for Greece’s eurozone partners to swallow. The burden of debt in and of itself rules out the "high-growth" scenario. Yet all other options leave Greece with debt-to-GDP near 150% for as far as the eye can see. 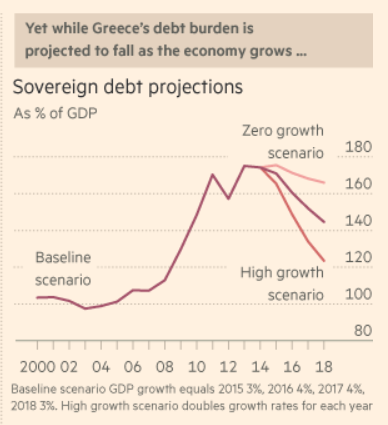 Recall that the Troika once said that debt over 120% of GDP was untenable. Now officials conveniently argue "the overall total matters less if annual payments are low and spread out over several decades". The longer this stretches out, the longer Greece will remain a mess. Recall that the Troika forced €245 billion of bailout debt on Greece just to prevent default on €40 to €50 billion or so in obligations. Bailouts never made any sense. However, what makes the most sense now, is to recognize what cannot be paid back, won't. Given that Germany and now Finland don't want to make that kind of ruling, outright default and a eurozone exit looks increasingly likely. Should that happen, the creditor countries will all be worse off than if they did grant a change in terms. What's going on is an amazing game of financial chicken, arguably coupled with financial ignorance. Let's take a look at Finland and Germany's Responsibility should Greece default. Here is some charts and commentary from Bluff of the Day: Germany Warns "Greece is No Longer of Systemic Importance For the Euro". Here's a second table that will put a potential €245 billion default into proper perspective based on percentage liabilities. A quick check shows that Finland would need to come up with €4.3 billion? To Finland, that's a huge pile of money. Where will any of these countries come up with their share? Greece was no systemic threat to the eurozone until the Troika foolishly threw €245 billion at Greece hoping to prevent a default. Curiously, the Troika made Greece a systemic threat by pretending it was, when it really wasn't. And now that it is, they pretend that it isn't.